Heading for 5,000 visitors . . . Even after the success of yesterday’s Open Day, the crowds continue to be attracted to the Ness. Most seem to be attracted not only by the superb archaeology but also the chance to see archaeologists in “action” and have all their questions answered directly. It really does seem to capture the public’s imagination and already this year we have quite dramatically surpassed the “head count” of over 3,000 visitors from last year, with every possibility that we may reach the 5,000 visitor mark this season! Sandra, one of the Historic Scotland rangers, leads the afternoon tour. Today, we had a visit from Professor David Sanderson and his team from Scottish Universities Environmental Research Centre (SUERC). They are attempting to develop a new dating technique for actual stone! How this works seems a bit like “black magic” and no attempt will be made here to try and explain the science behind the technique. If this does work, we should be able to date when a stone was last exposed to sunlight and so get a date for when the stone was incorporated into a structure – amazing! Professor Dave Sanderson and his team prepare to take samples for their new dating technique. In order to get suitable samples, these have to be retrieved in darkness so as to not “contaminate” the stone. A small tent was therefore erected over part of the site so suitable stones could be removed. We will keep our fingers crossed that this new technique will be able to complement our more usual dating techniques. And the Lesser Wall revealed yet another surprise today. 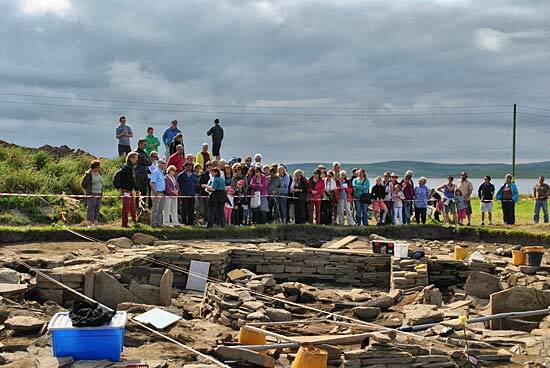 The paving revealed at the front of the wall had been expected to be sitting directly on the “natural” boulder clay, or bedrock, in order to provide a stable foundation for the magnificent Lesser Wall, as in the case of the “Great Wall of Brodgar“. Removal of a section of this paving, however, has revealed rich midden deposits under the paving and a wall line that seem to extend below the Lesser Wall! Structures below the Lesser Wall. We therefore have structures, and occupation, that predates the Lesser Wall on which it was built. This is somewhat surprising since there is no obvious subsidence associated with the Lesser Wall, unlike other structures on site that have been built over earlier structures – it seems as straight and vertical as the day it was built! However to have discovered earlier structures on site should in itself be no surprise as both the original test pitting and some of the geophysical surveys indicated a huge depth of archaeology on site. How does this revelation fit into the overall site interpretation we have yet to fully fathom – watch this space! With each passing day, the internal structure, but also complexity, of Structure Ten becomes clearer as more of the floor deposits are exposed. Where wall lines have been robbed out, the negative impressions of where stones were indicate “ghost” inner wall faces, as do slots where orthostats (upright stones) once stood and defined space within the building. In the south-east corner of the inner chamber there has always appeared to be an inconsistency in where we thought the walls should be. This afternoon, however, Antonia discovered, low down, the remains of two parallel potential wall lines that seem to be leading into the outer wall – could these be defining the entrance into a side chamber? In the south recess of the central chamber of Structure Ten, Clare has been investigating a stone box set into the floor. Within this box she has discovered the remains of a squashed, but upright and complete, pot that completely fills the bottom of the box. Although broken into many fragments, careful excavation has recovered all of the fragments. Residue analysis may resolve why this pot was placed here and what it contained and was used for. Clare excavating the near-complete pot that sits within a stone box set into the floor of Structure Ten. It’s one of those days on the Ness of Brodgar that really takes your breath away. It’s the most beautiful weather today, lots of sun, a steady breeze to keep the midges from bothering you. The hills of Hoy to the south-west, every detail picked out by the sunlight. The Ring of Brodgar sits quietly to the north-west, between the Lochs of Stenness and Harray. Everyone on site is busy working away, spurred on by the good weather. I’m Adam Lee and I’m up in Orkney for two weeks digging at the Ness of Brodgar. I usually work in Worcester as a professional archaeologist but have taken time off work to come and volunteer on one of the best sites I’ve ever worked on. I came up last year to dig for a week and decided then that I wanted to come and dig on the Ness again (If they would have me). I’ve been coming to Orkney for a few years now as my brother moved here. The more times I visit, the more I fall in love with this amazing group of islands. She had certainly hit the nail on the head. Thankfully the “lots of stone” on site forms Neolithic structures like none I’ve seen before. The five main structures in Trench P – Structures One, Seven, Eight, Ten and Twelve each have their own stories to tell. The preservation of the walls and associated structures is impressive and the finds from the site are amazing. I’ve been working in Structure Ten for just over a week now and I’m really starting to get to grips with its complex structures and deposits. I’ve been excavating around the central hearth. I’m currently removing a deposit, rich in animal bone, that lies directly over the hearth. Does the animal bone represent the last feast to send the building off before it was demolished and laid to rest? Just to the south of the hearth Clare has been excavating a stone box with an almost complete pot within it, all very exciting. Antonia (Structure Ten’s supervisor) and Ken have been working on the deposits just to the west of the hearth, in front of the “dresser”, to try and understand more about how this structure was deliberately dismantled and filled with midden. Emily is working just to the west of the ‘dresser’ to try and establish the relationship between it and the wall of the inner chamber. It’s another interesting part of Structure Ten and, hopefully, Emily will be able to establish if the “dresser” is freestanding within the central chamber or built into the wall behind it. Mike is working in the annex at the east end of Structure Ten. He recently lifted a large stone slab which revealed a deposit containing animal bone and limpet shells. Mike sees this as clear evidence that Neolithic people where familiar with the concept of a “surf and turf” supper. With just over a week left of excavation on site before it’s covered up for another year, we are all working hard to get as much excavated, and recorded, as we can. Especially today as the forecast for the rest of the week isn’t looking good. Let’s hope the weather is kind to us this week, none of us want the rain to stop play on this amazing site.